The last few months have been a time of rapid change and reflection. With the many changes you all are aware of — in health care, medical education and research — we face important decisions. 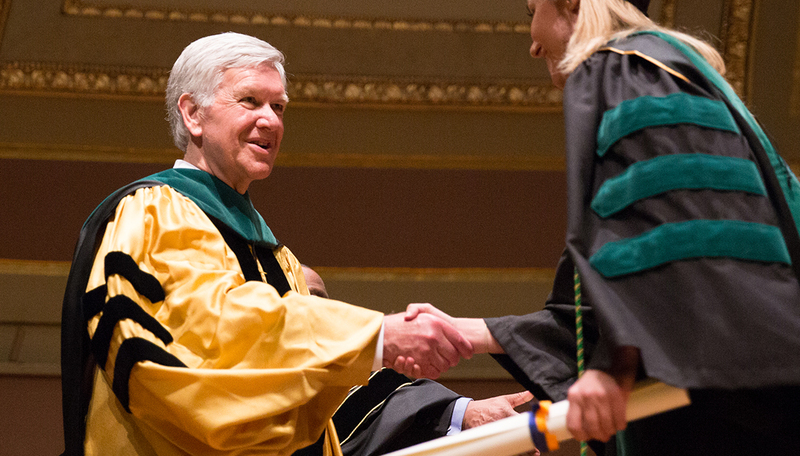 These decisions will shape the future of our medical school for many years to come. The University of Michigan Medical School has long been a leader in all of our missions and together, we will continue that trajectory. This is an effort of many leaders and countless faculty, staff and students. Developing a strong leadership team has been a highest priority for me and just recently, we added another key person to this group: our new executive vice dean for academic affairs. This new role was created to focus on the strategic direction of our medical school and to ensure that we remain competitive in our educational programs and our faculty recruitment. Additionally, this role will collaborate closely with me and the senior leaders of our clinical and research efforts to ensure cohesive institutional priorities. I am delighted to announce to you that one of our own, Dr. Carol Bradford, is our new executive vice dean for academic affairs, effective July 1, 2016. Dr. Bradford received both her undergraduate and medical degrees from U-M, and went on to complete her otolaryngology residency here. She has a deep understanding of our strengths, challenges and culture and will be a much-valued asset to my team. I feel a great sense of optimism and positive change. Not only are we welcoming new leadership to U-M, we are embracing an era of rapid technological advances and new definitions in health care. The way we deliver care will no doubt evolve to consider homebased services, telemedicine, eHealth and various other technologies that empower and inform our patients. As I consider experienced clinicians navigating the host of technological advances, I am reminded that our profession is a delicate balance of art and science. For all of the science and technology that abounds, the practice of medicine is still an elegant art form shaped by human interaction and patient experience. In addition to our technological wizardry, we offer our patients the compassion, empathy and human touch that distinguish us from other institutions and alumni. With these values, we continue our commitment to the betterment of our patients’ health and their everyday lives, reflected in the professional training that fosters the art as much as the science of medicine.